A subscriber either manually inputs his email or checks a a box confirming he wants to opt-in to the list. A welcome email is sent. Reliability: Most reliable method; default setting for new accounts. Only the true owner of the email address can sign up and confirm their subscription – therefore generating very few complaints, if any. It also prevents you from adding any incorrectly typed, role-based or spam trap addresses to your list as they will never complete the confirmation process. Steps: A potential subscriber provides his email or checks a subscription box. Generally results in a higher spam and/or bounce rate that can lead to serious delivery problems. Steps: Email addresses are added despite the fact that the contact took no specific action to be added to the list, such as a pre-checked box when submitting their data on a form, as part of a checkout process or during account creation. Can make recipients feel as if they were tricked, damaging your relationship, reputation and in turn your delivery in the process. Typically generates a large volume of emails flagged as “SPAM” which negatively affects your Sender Reputation and in turn your delivery rates. Under the Canadian Anti-SPAM Legislation, this type of consent expires in 6 months for leads and 24 months for active customers. Note: we can only calculate this rate based on the number of people who displayed the images (open) or who clicked on a link in the email (implied open). Most email clients don’t display images unless the sender is a “trusted sender” or the user clicks on the link to display images. You might have a large portion of text-email (rather than HTML) recipients on your list. Relationship with the list: For example, an older, non-reconfirmed list will not perform nearly as well as a targeted campaign. Get delivered: Internet Service Providers know exactly how many of their users are opening/clicking/deleting/ignoring your emails. If you are sending to an active list of people that are engaged with the content you are sending them, you’ll build your good reputation. Frequency: Sending on a regular basis, which you should communicate to your subscribers. Subject: Clear and explicit subjects will yield higher open rates. Multiplicity: A lot of links (since, as previously mentioned, links that are clicked are considered “implied opens”) and many small images. Encouraging people to display images at the top of your email: A quick sentence like: “Not displaying the images? You’re missing out on the picture our latest arrival!” or “Experience this email to the fullest: display the images” can get your subscribers to show the images – yielding you more accurate results. Note: Your email should be short and succinct. People have a 15-20 second attention span when they’re reading emails. Make sure you always have many links linking to more information. Interest: If people don’t care, they won’t click to get more information, so keep your campaigns as targetted as possible. Location of the link: if it’s hidden in the footer of your email, not many people will see it. What is a subscription confirmation email? A subscription confirmation email is an email that is sent out to new subscribers in order to confirm that they want to subscribe to your list. Important: The subscriber will not be added to your list until they have clicked on the link. If you are testing your form and do not receive this email in your inbox, check your spam or junk mail. As long as this confirmation email remains active, your list will remain in confirmed status. Why is this important? If you wish to edit this email, access your contact list and click on Manage Emails on the left hand menu. The [CONFIRM_LINK] must be in the confirmation email ! This is what will create the unique confirmation link that enables your contacts to confirm their subscription! Your contacts must click on it in order to be added to your list. Is there Social Media integration? WebbPlatsen currently offers two types of social media integration – one to share your campaign, and the other to add follow links to your Facebook or Twitter pages. The Social Media Toolbar will allow you to insert a toolbar on top of your email, allowing people to forward the campaign to a friend or share it on Facebook or Twitter. To insert it, simply click on Insert Social Media Toolbar under the Advanced Options when creating your campaign. A social media section is available to be inserted in Optimized Templates only. Simply click on the Facebook/Twitter icons under Add section to insert the section in your campaign. To edit the links, hover over each icon and add the direct link to your social media page. How do I add personalized fields to my campaign? Click on Manage List Structure on the left-hand menu. You will see default fields already available (Contact ID, Email, Sign Up Date) which are created automatically by taking the information entered when a you signed up for your account. These cannot be removed or edited, as they are used by the system to track subscriber information. Custom fields cannot have punctuation marks, special characters or spaces. – Phone numbers, age, etc. Once your custom field is created, it can be used as personalized content in your campaign. This can be included in either the subject line or the content. To add personalized fields to your campaign, you can either type them manually or use the drop-down menu in the editor. Remember: If you are adding the tag manually, keep in mind that the tag needs to match the field name exactly. You can also use fallback fields if no data is currently available. You can also work with our default merge tags, available through the Item drop down menu in the editor. Senders who use a ‘noreply@’ email as their From address give the impression that they don’t care about feedback. Email is a two-way means of communication; using noreply@ can prevent important customer feedback to make its way back to you, especially if you don’t give alternate contacts within the body of the email. Emails are more likely to be flagged as SPAM. Using a noreply@ address has been associated to lower open rates, more unsubscribers and higher complaint rates. Email has been around since the Internet made its debut on CD’s that were mailed to you. Back when phone lines were used to connect to the World Wide Web. So you might think email is a bit old fashioned. Good for old curmudgeons, or for sending pictures to Aunt Lorraine. But what’s one of the things that’s interesting about email is that, even in this day and age, people will check up on their inbox several times a day – in part due to the prevalence of smartphones. It’s a good way to talk to them when they want to hear about you, because they want to hear about you. You can also target specific content to certain users, based on previous actions they took in regards to emails you’ve sent, or centered around questions you asked them, personalising the information that is sent to them. The information you gather doesn’t stop there: thanks to the detailed reports you get, you can gauge what your customers want to hear about, and model your social media messaging to reflect the input you received. With low costs and flexible plans you don’t have to be big to benefit. Your sender name, subject line and preheader text are the key to getting subscribers to recognize and, ultimately, read your messages. People tend to skip (or send to the junk folder) emails from unknown senders. Your sender name on each email should be recognizable and consistent. This typically means using the name of your company or brand. It can also be a good idea to include the name of a person or specific role. Try to avoid ambiguous “from” addresses, like “Newsletter” and “no-reply@”. Subject lines are also crucial in grabbing attention. They should create interest in the email’s content. A good subject line answers the question “why should I read this email?” and a clear, specific description of the email’s contents usually works best. Keep it as short as possible, while still saying what you need to say. You should always be testing the waters with different approaches. Your subscribers might, respond to teasing subject lines, questions, or subject lines of different lengths. Don’t use a lot of exclamation points!!!!!!!! Try to avoid of words like “Free” and most things related to gambling. Be sure to test your emails, with the built-in tools and by sending emails to yourself, to see where they land. The preheader is a one-line snippet of text placed at the very top of your message that you can use to complement the subject line. Some email clients show the snippet even before the email is opened, so you can use it to remind people where they signed up, to ask people to add your name to their contact or to display images in your email. A good email design includes a mix of text and images, with important headlines, links and information in text form. Logo: should be clickable and link back to your website. Short sentence: What’s in the email or prompt to show the images. 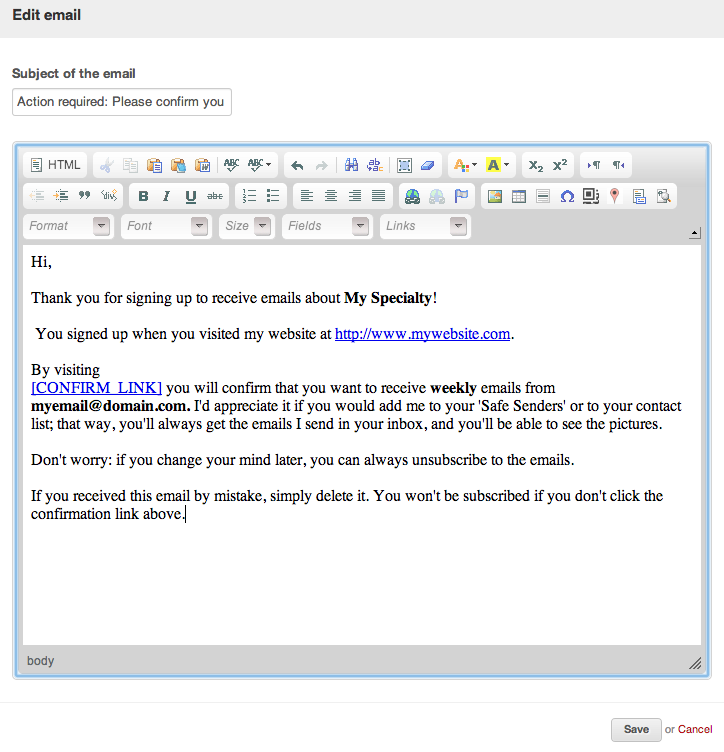 Short paragraph of text, or bullet points with main features: no more than a few sentences; the email should redirect to a landing page where more comprehensive information can be found. Many, small images: Ideally clickable; all presenting alternate (“alt”) text. Additional offers and information: Should follow the basic content structure of the primary message. Can be divided by a horizontal line for visual appeal. If you have information like first name, personalize the content.